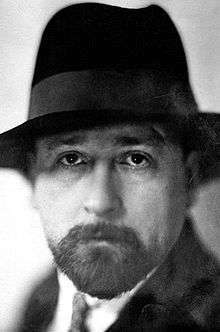 Albert Londres (1 November 1884 – 16 May 1932) was a French journalist and writer. One of the inventors of investigative journalism, Londres not only reported news but created it, and reported it from a personal perspective. He criticized abuses of colonialism such as forced labour. Albert Londres gave his name to a journalism prize, the Prix Albert-Londres, for Francophone journalists. Londres was born in Vichy in 1884. After finishing secondary school, he went to Lyon in 1901 to work as a bookkeeper, then moved to Paris in 1903. He wrote occasional articles for newspapers from his native region, and published his first poetry in 1904. The same year, he started as correspondent in Paris for the Lyon newspaper Le Salut Public. Also in 1904, his daughter Florise was born, but his partner, Marcelle (Marie) Laforest, died one year later. In 1906 he became parliamentary correspondent for Le Matin. His job was to listen to gossip in corridors of the French parliament and report it in anonymous columns. When World War I broke out in 1914, Londres, unfit for military service due to ill health and a weak constitution, became military correspondent for the newspaper at the Ministry of War. Subsequently made war correspondent, he was sent to Reims during its bombing, alongside the photographer Moreau. Londres' first big article told of the fire in the cathedral on 19 September 1914; the report was published two days later. Londres wanted to go to the Orient; the editors of Matin refused. So he left to become a foreign affairs reporter for Le Petit Journal. In 1915 he went to south-east Europe to report on combat in Serbia, Greece, Turkey and Albania. On his return, he covered the end of the war in France. In 1919 he was sacked by Le Petit Journal under the orders of the French Prime Minister Clemenceau. Continuing his vocation, Londres reported that "the Italians are very unhappy with the peace conditions concocted by Clemenceau, Lloyd George and Wilson." He then worked for the illustrated daily Excelsior which had sought him. In 1920, Londres succeeded in entering the USSR, described the nascent Bolshevik regime, profiled Vladimir Lenin and Leon Trotsky and told of the suffering of the Russian people. In 1922 he went to Asia. He reported Japan and the "madness of China". He also covered Jawaharlal Nehru, Mohandas Gandhi and Tagore in India. From 1922 his articles began to be published as books by Albin Michel through Henri Béraud, literary editor of Le Petit Parisien. Londres started investigative stories for Le Petit Parisien. In 1923, he went to the penal colony of Cayenne in Guyana. Describing the horrors, his reports produced reactions in public opinion and the Establishment. It must be said that we in France have erred. When someone – sometimes with our knowledge – is sent into forced labour, we say "He has gone to Cayenne". The penal colony is no longer at Cayenne, but at Saint-Laurent-du-Maroni first of all and later at the Îles du Salut. I ask, by the way, that these isles be debaptised, for they are not the Isles of Salvation, but the Isles of Punishment. The law allows us to behead murderers, not to employ them. Cayenne is nevertheless the capital of the penal colony. (...) Finally, I arrived at the camp. The labour camp. Not a machine for producing well defined, regulated, uniform punishment. A factory churning out misery without rhyme or reason. One would search in vain for any mould to shape the prisoners. It crushes them, that's all, and the pieces go where they may. And the article continued: "I was taken to these places. I was taken aback by the novelty of the fact. I had never before seen fifty men in a cage. [...] They were getting ready for night. The place was swarming with them. They were free from five in the evening until five in the morning – inside their cage." Londres also denounced "doubling". "When a man is sentenced to five to seven years forced labour, once the sentence is completed, he must stay in Guyana for the same number of years. If the sentence is more than seven years, he must stay there for the rest of his life. How many jurors know that? The penal colony starts with freedom. During their sentence they are fed (badly), they are housed (badly), they are clothed (badly). A brilliant minimum when one considers what happens afterwards. Their five to seven years complete, they are shown the door, and that's it." In 1924 he investigated forced labour in North Africa, where military prisons welcomed convicts of courts-martial. In 1929, while anti-Semitism was rife in Europe, he went to Palestine. He met the Jewish community and came face to face with an outcast people. He declared himself in favour of the creation of a Jewish state, but doubted peace between the Jews and the Arabs. "The demographic imbalance presages difficult days ahead: 700,000 Arabs versus 150,000 Jews" (Le Juif errant est arrivé (The Wandering Jew has come home)). He next went to the Balkans to investigate the terrorist actions of the Bulgarian Komitadjis from Internal Macedonian Revolutionary Organization (IMRO). This was to be his last completed report. He was killed in the fire on the MS Georges Philippar, the ocean liner taking him from China back to France. He seemed to have uncovered a scandal – "It was a matter of drugs, arms, of Bolshevik interference in Chinese affairs" reported Pierre Assouline's biography of Londres. But his notes were destroyed in the fire. Questions surround the fire – accident or attack? The only people to whom he confided the contents of his report – the couple Lang-Villar – died in a plane crash. Londres almost certainly was an inspiration to Belgian cartoonist Hergé, who created the fictional investigative journalist Tintin. Hergé worked at a busy newspaper and would have read of Londres' adventures. 1 2 Farr, Michael (2007). Tintin & Co. London: John Murray Publishers Ltd. ISBN 978-1-4052-3264-7. 1 2 Thompson, Harry (1991). Tintin: Hergé and His Creation. London: John Murray Publishers Ltd. ISBN 978-1-84854-672-1. ↑ Les comitadjis: le terrorisme dans les Balkans: récit. Motifs (Paris), Albert Londres, Les Editions du Rocher/Serpent à Plumes, 1997, ISBN 2842610342, p. 181. ↑ "Mandarins in Batches". TIME magazine. 3 October 1932. Maison Albert Londres, a not-for-profit organization working on the reconstruction and rehabilitation of the birth home of the reporter in Vichy. Wikimedia Commons has media related to Albert Londres.